The new surface is also aggregate but much finer than before. It has also been compressed by a heavy roller to form a more solid surface. 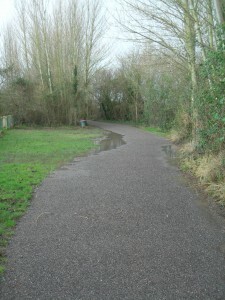 The result is a much improved surface for all users of the trail. The difference is most easily seen at the boundary between the Havant-owned section (the southernmost couple of hundred metres) and the Hampshire-owned section. The result is not perfect however. 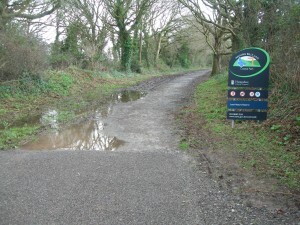 After last night’s heavy rain puddles have formed. There is, however, a clear patch between the puddles and they aren’t muddy like they were. We’ll have to wait to see how well the surface copes with traffic. It looks like it might get cut up easily by bikes and horses. In which case people with pushchairs might struggle with a loose surface. It’s also possible the surface will quickly deteriorate from there. For now, though, we can appreciate the improvement and hope that Hampshire will consider improving their section. We’re aware of scope for improving the section north of the Esso garage, but we’ve not heard of any plans for the bit in the middle – arguably the worst section. Please let us know in the comments what you think. Have you seen a similar surface used elsewhere? How was it over time? Looks good from the photos but have not been down the Billy for more than a week, mostly because of the mud and holes. We went along the new track from the Olive Leaf to the Funfair the other evening, and it has certainly made cycling on that stretch so much easier. Before, we had to tackle the grass patches and uneven tarmac on that part, risk the prom road with lunatics going by at 60mph a foot from our handlebars, or risk glowers from people if we cautiously used the pavement ( which is anyway very uneven and full of cracked and broken flags). Our only caveat with the new track is that it has been laid with pit-stones and we think it would be much better had it been smaller sized stones or shingle or even gravel. It also appeared not to have been rollered much so I guess they are waiting for it to compact on its own. Not that we are being ungrateful as we think we cyclists do very well on Hayling compared with some places! 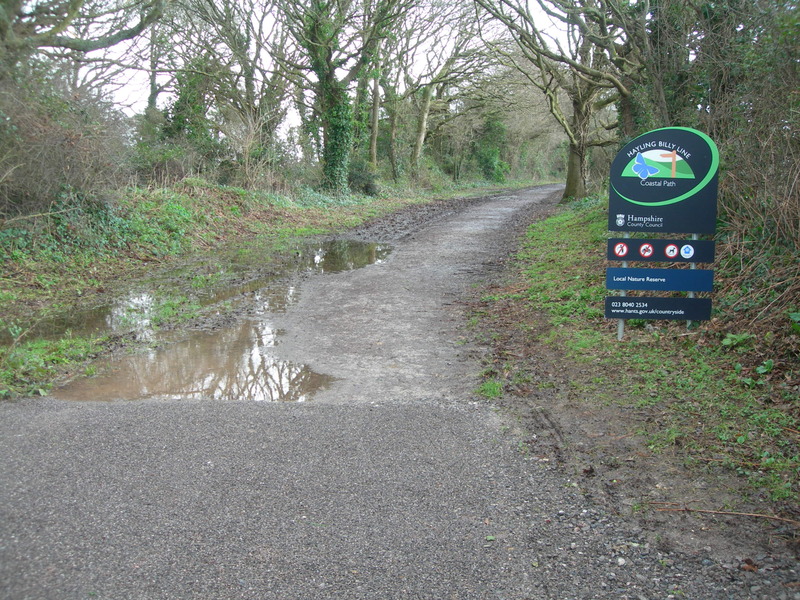 You and I are not experts in building paths suitable for bikes /horses/pedestrians and it seems neither are the folk who built the seafront path and “repaired” the Billy Trail at the south end. The only answer is to upgrade the Billy Trail to the standard of the Langstone/ Havant section and to think again about the seafront path. Do we want a firmer surface? Does it mean we’ll get an urban footpath along the seafront to full council standards and will we then have street lights as well?That would mean the demise of a unique part of Hayling ,or will the Health and Safety brigade win the day ?Upgrade the footpath to shared pedestrian/cyclist status and stop carving up the surface of the green parts with these schemes which do not work and cost money better spent elsewhere doing work properly. Two half hearted schemes do not make one good one.